With an increasing number of airports getting busier each day, the journey from airport entrance to the terminal can seem like a never-ending maze of checkpoints. Regardless of whether you are an occasional traveler or a frequent flier, the unpredictable waiting time at the security and the long queues at the immigration and the baggage counters can leave you exhausted even before you have started your journey. Here are six effective tips to get you through the airport quickly, making your travel comfortable and stress-free. Having a pre-printed boarding pass before you reach the airport will enable the airline officials to check your baggage quickly. Online check-in also enables you to block a seat near the aircraft exit, making you one of the first passengers to disembark. Most airlines also offer smartphone applications that store your flight information, enabling you to check-in early. You can use these applications to download your ticket and procure your e-boarding pass, negating the need for paper printouts. Packing items in layers will help the security get a clear picture of what’s inside your bag during the screening process. For instance, pack shoes, clothes, accessories, toiletries, and electronics in separate layers for faster security screening. Get yourself familiar with the TSA (Transportation Security Administration) regulations to be carrying the items that aren’t allowed onboard, facilitating the screening process. Packing extra electronic items means you will have to remove each of these devices and place them in the bin that passes through the X-ray machine. The more the electronic gadgets you carry, the longer you will take to pass through security. Hence, only pack in what is absolutely essential for your trip. If you suspect your check-in baggage is overweight, weigh your bags before leaving for the airport. It is wise to invest in a handheld digital luggage scale that can easily weigh up to 50 kg, enabling you to stay within the baggage weight limit. Consequently, before reaching the check-in counter you can swap items between your pieces of luggage in the comfort of your home, avoiding the scrutiny of the airport authorities and the airline staff. This simple act will prevent annoying surprises at the airport, enabling faster check-in. Though suitcases with wheels are in fashion, backpacks enable you to fit in more items and whiz through jam-packed areas, helping you get to the other side in no time. Clutter can cause you more delay than you can imagine. Organizing your travel bag pack can save you a considerable amount of time at the airport. Keep vital documents, namely the air ticket, the boarding pass, the passport, and credit cards in an accessible section of your bag. This simple exercise will not only prevent you from leaving behind your crucial travel documents but also save the time wasted in looking for them in the moment of need. All airports have restrictions on the volume of liquids and medications you can carry through the security gates. Moreover, every passenger has to take off his/her jewellery, coat, hat, shoes, and other accessories when walking through the screening machine. Before going through the security, make sure all the liquids, namely shampoo, mouthwash, or lens solution are less than 100ml and packed separately in sealable plastic bags. If you are wearing a garment with metal buttons or buckles, it is best to place them on the screening tray, saving you the time and effort involved in backtracking. Wear a comfy pair of trousers, a cozy sweater or cardigan, and a stole or a jacket to keep you warm on the flight. Keep your jewellery, belts, and keys in your carry-on bag or jacket, before you place it in the tray. Wear socks and slip-on shoes instead of sandals or steel-toe boots, enabling you to pass through the metal detectors without any delay. If you have to wear boots, wear the ones you can slip on and off easily. It is wise to invest in TSA-approved laptop cases and toiletry bags, enabling you to get through the security line quickly. These bags meet the security standards and are checkpoint-friendly, meaning you don’t have to take the electronic gadgets out separately at the screening machine. If you are planning to leave your vehicle at the airport, it is wise to check the airport parking status and book your space in advance to avoid last moment delays. During peak travel hours, the parking lots get occupied quickly, causing a lot of anxiety for people who drive in with their cars. Numerous airports have facilities such as online parking directory and reservation networks that offer the best airport parking lots at cost-effective prices. Booking your parking space in advance will also enable you to determine its proximity to the terminal, helping you navigate easily without wasting your time. Expedited screening programs can help speed you through the security check, saving your valuable time. 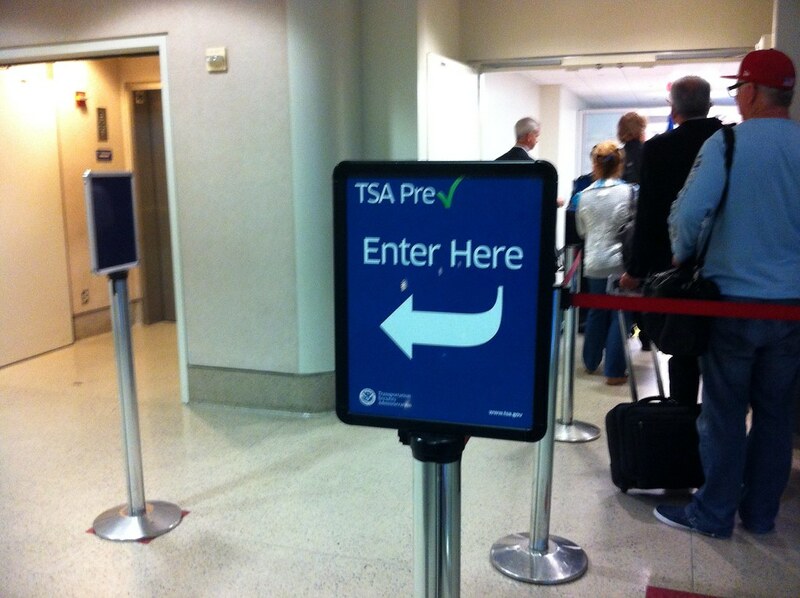 The TSA PreCheck and the Global Entry are expedited programs that allow trusted travelers to use special lanes to whiz through the security. Members of this program are pre-screened, hence they do not have to take off their shoes, belts, and coats or remove laptops or toiletries as they pass through the security, the federal government immigration, and the customs. You can avail this service by becoming a member of the TSA by enrolling online and paying a membership fee ranging between $50 and $100 for a period of five years. When making an airline reservation you need to enter the ‘known traveler number’, which will notify the airline staff of your TSA PreCheck qualification. Navigating through busy airports can be extremely nerve-racking even for the most seasoned traveler. The above-mentioned tips will help you travel through the airport swiftly, saving your time and enabling you to stay relaxed during your trip. Mattie Elsner is a passionate globetrotter and travel writer by profession. When she isn’t on site at exotic locations you can find her blogging for sites like About Airport Parking – a leading reservation network and directory for travelers. Learn more about travel and join the fun. Follow her on Twitter – @MattieElsner.